Google last week officially launched its ‘Podcasts’ app on the Play Store, but much like the Google Assistant app, the new software isn’t a full-fledged application in itself, but rather, enables users to easily launch the podcast component already present within the Google app. Now an APK teardown of version 8.9 beta of the Google app shows that the the podcasts feature is all set to get a new ‘Trim silence’ option as part of a future update. 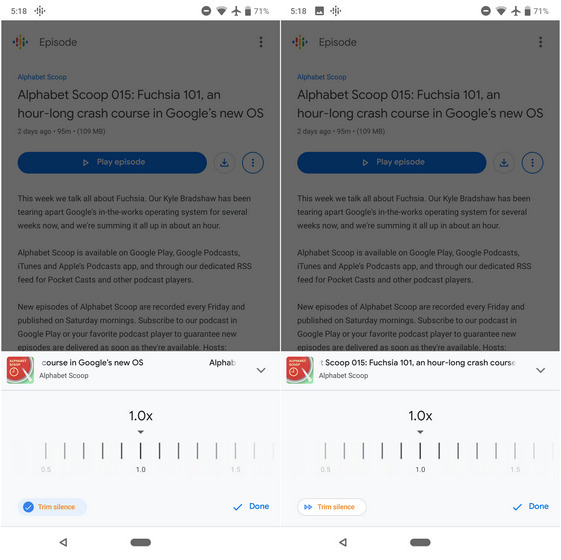 According to 9to5Google, the new feature will help shorten the length of episodes by eliminating pauses and other gaps. It will apparently be hidden from plain sight, but users will be able to access it from the expanded audio controls. The setting is seemingly available for all podcasts, irrespective of whether they are being streamed online or have already been downloaded on the device. The app already has some of the most popular shows including The Daily, Modern Love, and more. There are a lot of choices on Google Podcasts already, and since this is Google, the collection will very likely only grow bigger with time. It’s worth noting that Google Podcasts can be synced with Google Assistant, allowing users to stream shows on Assistant-compatible smartphones and smart speakers, including Google Home speakers and other devices. The podcasts home screen shows a list of all the shows a user is subscribed to, and tapping on any of the options provides a list of all available episodes, with users able to download for offline listening. While those who are already part of the beta-testing program for the Google app can already test out the new feature, version 8.9 of the app is expected to hit the stable channel in a few days’ time, so users who are not part of the program shouldn’t have to wait to long to get it on their devices.